Can you believe? : Are Quakers marginal? First, our numbers are microscopic. The number of Roman Catholics in Philadelphia (somewhere over half a million) far exceeds even the most inflated number of Friends in the whole world. If there is anything to "the wisdom of crowds," the wisdom of the crowd representing the world's population seems to be that "Quakers are marginal." Second, even among those who've heard of us, some criticize and some admire our characteristic ideals, but few seem to understand our core passions and conceits. As an example, I cite this book (pic at left) by Alexander Dvorkin, Сектоведение: Тоталитарные секты (Sectology: Totalitarian Sects), which actually set off this train of thought in my mind. In discussing the meaning of the word "sect," Dvorkin has this casual assessment of Friends on page 44: "Classical (for lack of a better term) sects usually refers to Mennonites, Quakers, Adventists, Pentecostals, Doukhobors, Flagellists, and other marginal (in relation to Christianity) groups." Quakers are mentioned two more times in this 800-page book: as the background of the family from which the founder of the Worldwide Church of God came, and the denomination where Vineyard cofounder John Wimber was serving as a pastor when he began speaking in tongues. Obviously in a book on authoritarian cults, Quakers should not take up a lot of space! I'm just bemused by the company we keep in Dvorkin's book, and his offhand characterization of us as marginal. My first impulse is to marginalize Dvorkin as narrow, provincial, and tendentious, but that won't work: He got much of his education and exposure to religious variety in the USA, and furthermore his writings and interviews reveal a modest and (usually) even-tempered scholar. Allowing for his own Russian Orthodox bias, his book is a fascinating and useful resource. Dvorkin is far from being the only student of religion who reveals how tiny an impression we make as believers (as distinct from the somewhat disproportionate space we take up as social reformers, scientists, etc.). I'm turning around and grabbing a book on the shelf behind me, Elizabeth Isichei's A History of Christianity in Africa, as a handy example. There are more Quakers in Africa than anywhere else, but aside from one tiny and inaccurate bit of statistical trivia, she includes absolutely nothing about Friends in East Africa. The third aspect of our being marginal is harder to sum up. It relates to the impression I sometimes get that we marginalize ourselves. There's a naïve superiority that we sometimes display in our ecumenical relations, exemplified by the Philadelphia Friend who said in my hearing in an ecumenical gathering that he has a "hard time taking hireling priests seriously." Among those who heard him, their capacity to take Friends seriously was probably reduced. Here's another example. Martin Kelley, in a comment to his own post, says, "When the Christian Peacemakers were held hostage we saw a lot of Quaker organizations stumble trying to respond. With Tom Fox we were confronted by a full-on liberal Quaker Christian witness against war, united with other peace churches and who was there to explain this as prophetic witness? AFSC? FCNL? FGC? Nope nope and nope. There were too many organizations that couldn’t manage anything beyond the boilerplate social justice press release. I held my tongue while the hostages were still in captivity but I was mad at the exposed fracture lines between religious witness and social activism." Well, we Friends proudly avoid dependence on "hireling priests" ... to what end? A more adequate public voice? Apparently not. First, if we're going to be marginal, let's at least be creative here on the margin. Let's continue to develop passionate dialogues on the core of our faith, the core of our motivation, and perhaps be a little more humble about our specialness. A closer communion with Jesus and a more robust expression of the social dimension arising from that communion is all the uniqueness I need, and it in fact ties us in with the most amazing networks worldwide, some of whom may actually have never heard of us. Second, as we conduct our dialogues and deliberately encourage each other's discipleship, let's be attentive to the ways we can open up our communities. Reedwood Friends Church is now home to Spanish-language Bible studies and a new Russian-language fellowship, in our ongoing efforts to open more doors. I can't advocate any particular formula except to be constantly alert to every aspect of quakerishness that can alienate others, not to reject it automatically but to subject it to the "why" test. Third, I hope that the cumulative impact of this faithful dialogue and new seriousness about consistent discipleship, if it doesn't exactly take us out of our marginal status in the world, at least changes it. If we are marginalized because the world can't figure out what to do with our subversive message, because the "powers and principalities" continue their tired line that the Prince of Peace and his followers are clueless about how things really work in this world, because we steadfastly oppose objectification of human beings, that's one thing. That's different from being trivialized by inaccurate superficialities, or worse, trivializing ourselves. "A very, very grave mistake"? Read the speech and decide for yourself! Those "very, very grave" words came from interim U.S. ambassador to the U.N. John Bolton as he lashed out at the interesting and (in the eggshell-walking public culture of the United Nations) relatively frank speech made by deputy general-secretary Mark Malloch Brown in New York a couple of days ago. More background here. Guardian columnist Ian Black comments gently that it is a bit much for John Bolton, famous for leading with his rhetorical fists, to criticize someone else for a bit of honesty. Perhaps Bolton believes that it is unbecoming for anyone but an American to speak bluntly. Or perhaps it is a grave mistake for anyone who seeks U.S. funding to assess American behavior accurately in public. Hi again, Johan! I would like to suggest, if I may, that marginalization is not the bad thing that your posting assumes. To begin with, we might note that, from Moses and Elijah to the Baptist and Christ, the biblical prophets were almost inevitably physically marginal people, residing on the wilderness edges of the society they addressed, in places where they could get some perspective and be out from under the thumb of society's rulers. The Desert Fathers, the Celtic Fathers, and Francis of Assisi were much the same. In the Quaker movement it is easy to think of prophetic Friends who were marginalized by their leadings -- Fox, Penn, Woolman, Bayard Rustin. If they did not literally reside in the desert on civilization's margins, they did the metaphorical equivalent, residing in the Light, in a set of visionary truths, and in a Society, all of which stood outside civilization's norms. Writing in his book The Ritual Process, anthropologist Victor Turner talked about the marvellous power that marginal life, combined with spiritual practice, can have to release the faculties of the spirit, and in this context observed that "Poets and prophets are 'edgemen'." Turner's point was that marginalization does not just give the prophet perspective and freedom from social pressures, it also puts the prophet's spirit in a place beyond definition, which unleashes things that physicists have difficulty explaining. The miracles done by the prophets and saints (and by Fox, according to his own account) bear witness. My own sense has long been that our Society suffers much more from the craving for safety and respectability -- e.g., members sheltering from the risks of their own prophetic callings in safe academic positions; members reducing their initial callings to a round of potlucks and committee meetings -- than it does from its marginalization. Might it not be that the Philadelphia Friend's true error was not his public denigration of "hireling priests", which marginalized him a little bit, but his failure to follow through on that promising beginning with a real, totally self-marginalizing, George Fox-style fire-breathing sermon against the lazy professors at that ecumenical gathering? The successful prophet, it seems to me, is the one who lets go of the social safety net and lets herself float in the abyss, held up solely by the power and mercy of God. I find in my own experience that this is very hard to find courage to do! (So far in my life I have failed much more often than I have succeeded.) But if we feel ourselves called to prophetic action, then we are called to do this total self-marginalization as part of that action. If we fail to do it, and then our prophetic action fails, it is wrong to blame our marginalization. What we actually should be blaming is our own failure to keep faith with the call, to sell off our social safety net and give the proceeds to the poor, and then to come, take up our cross, and be truly marginal as Christ was. Hmmm: funny to read this as I picked up a book "The People Called Quakers" by Elton Trueblood this weekend. So where does marginalization fit in that statement? Was the early Quakers' vision faulty? Was it simply for their generation and not to be passed down to later generations? Yes, I feel called to live a lifestyle that the world might classify as 'marginal' - a lifestyle radically different than that of the culture's norm (not that I do it by any means: it's a daily seeking). But by no means do I believe God wants to have a marginal number of followers. I've heard folks refer to Quakers as more of a prophetic check in the world; and yet there seems to be a number of other roles that are required to function as a body of God. If those other roles remain marginal, then the body limps along - it's lacking wholeness. How exciting! How can I not share that with others?! I pray that I seek God, hear what He says, and follow. May my vision mirror God's vision, that of compassion for the *whole* world. Marshall: You said, "My own sense has long been that our Society suffers much more from the craving for safety and respectability -- e.g., members sheltering from the risks of their own prophetic callings in safe academic positions; members reducing their initial callings to a round of potlucks and committee meetings -- than it does from its marginalization." But doesn't the craving for respectability and safety represent a form of self-marginalization? Back to you: "Might it not be that the Philadelphia Friend's true error was not his public denigration of 'hireling priests', which marginalized him a little bit, but his failure to follow through on that promising beginning with a real, totally self-marginalizing, George Fox-style fire-breathing sermon against the lazy professors at that ecumenical gathering?" His self-marginalization consisted of an apparently flip condemnation of a whole group of people without knowing them, and without comparing their context with that of Fox's time, when many priests were patronage appointees or similarly picked and paid without regard for spiritual gifts or any mutual accountability with their community. This is hardly the situation with most pastors and priests now. A fire-breathing sermon against lazy professors would also have been totally out of order, because he hadn't earned the right (through relationship and personal knowledge) to say anything about the others present. I'd agree with you on the larger point that (risking a paraphrase) marginalization that results from faithfulness is not at all a bad thing. However, marginalization that results from inaccessibility and a self-image of spiritual aristocracy is a terrible pass for us to have come to, if it's true. 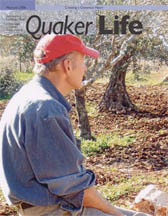 I want many, many people to find their homes in the Quaker movement, because when I came among Friends, I felt as if I were reliving the first generation of Friends--a sense that God was not just touching me personally, but gathering me into a body that anchored itself in that direct experience, without hierarchical mediation or false social distinctions. That's a form of spiritual liberation that everyone on the planet is entitled to have access to, whether or not we Friends are the way they choose to access it through our doorways. So our prophets may be marginal, but their effectiveness should at least in part be measured by how much social change they set in motion. As Jim Wallis says, Martin Luther King was not one who stuck a wet finger in the wind, he changed the wind. And even though the prophets may operate from the margins, Friends are a church, a place where ordinary people can be born, grow up, have a social context, perhaps get married, have children, etc., and die, knowing nearly all the time exactly who is praying for them. We do not exist to exalt our prophets or our public ministers, we are a body that cares for each person. How can we possibly be content to assume that the millions who are in oppressive spiritual places or none at all should not be Quakers? Shouldn't we at least ask, is the lack of millions of Quakers due to our special faithfulness, the incredible quality of our prophetic message, or because we have failed to be faithful and because our prophetic message has at least to some degree been squelched? I'm being blunt, but I am not pessimistic. If we're a museum whose endowment is being frittered away, that would be a gloomy assessment, but if we're simply somewhat dehydrated and would be able to regain our public vocation with a fresh infusion of living water, then there's no reason that our present marginal status need limit our influence in the future. Sometimes when I find Friends getting a little too self-important and going on-and-on with some pompous naval-gazing I like to remind them that our society is so small that statistically speaking we don't even exist. I'm not a statistician but you know what I mean. I certainly don't think numbers are the primary measure of a religious denomination's faithfulness, but when you're this small you have to ask what's going on. It seems like every third person comes out of the Beliefnet quiz being called a Quaker and if if you belief Beliefnet is a bunch of hockum, it's still clear that a lot of our message is in tune with today's spiritual seekers (at least in North America). We have a fairly unique take on Christianity that should help us stand out from the denominational pack and yet we barely break the six-digit mark in the U.S. I don't know what to make of it, but it's worth noting that a few of us who did respond to the Tom Fox situation are hireling Quakers working in our free time. Hmm. Johan, many thanks for your reply to my comment on your posting. I can only offer a hasty response, I'm afraid, because I'm on the road. You ask, "Doesn't the craving for respectability and safety represent a form of self-marginalization?" My answer: that is not what I meant by marginal, and I'm not sure that it's what you originally meant by it, either. But maybe I read you wrongly? If so I apologize; it was never my desire to twist your words. You further explain that the Philadelphia Friend's "self-marginalization consisted of an apparently flip condemnation of a whole group of people without knowing them, and without comparing their context with that of Fox's time, when many priests were patronage appointees or similarly picked and paid without regard for spiritual gifts or any mutual accountability with their community." This requires a somewhat longer response. I understand your point that the Friend didn't know the people he was commenting on. But from where I'm sitting, I can't help wondering whether he might have seen into their conditions (as Fox did) even without knowing them. Ministerial discernment happens at the oddest times, and even emerges among asses -- yea, verily, even Philadelphia asses! Moreover, I am not convinced that most paid priests and ministers today have spiritual gifts and mutual accountability sufficient to exempt them from Fox's criticism. Most sermons I hear in churches today still seem to me to be unleavened by the immediate guidance of the Spirit, no matter how polished they may be -- and so, alas, does most of the pastoral counseling I've encountered. And as for the level of accountability nowadays, I wonder if you are remembering, e.g., the child-molestation scandals that erupted a few years back in the Catholic Church? If accountability were really at a meaningful level, such scandals would not have been possible. I've gone to my share of ecumenical gatherings. Many of them, in my experience, showed far less evidence of the living Spirit at work than I believe a Christian has the right to expect of her or his church. I don't know about the gathering you're referring to. I hope it was at a higher plane! But I can easily imagine that the Philadelphia Friend might have been quite right to yank a chain or three. We are in agreement that self-marginalization resulting from elitism and the like is not good. I’ve found this post and the comments to it helpful as I struggle with the ways in which I’ve felt called to the margins, the need to be faithful to those calls and at the same time to avoid pride, bitterness and other self-marginalizing attitudes that can result from loneliness. I am not clear either way abut the appropriateness of fire-breathing sermons. It seems to me that actually living our convictions is rather more powerful than talking about them. As Jim Corbett writes in Goatwalking, “The uncompromising attempt to live one’s highest ideals openly and consistently is therefore the most effective social action one can take. To live in opposition to the principles one proclaims is also the surest way to destroy them as social options.” It seems to me that that is a universal call, not only for Friends but for all who are trying to live in the Spirit—to live our highest ideals openly and consistently. It seems to me that spending one’s life doing meaningful and unpaid work is more essential—and perhaps also more effective-- than ranting against hirelings (after all, why should only the priestly vocation be worthy of being followed for love not money, or be endangered by the mixed motivations contingent upon ‘earning a living?’), refusing to earn degrees or amass prestigious possessions is more essential and effective than inveighing against ostentation, living chastely is more essential and effective than condemning promiscuity.. Some people may be called to speak publicly about the changes we must make as a people (as Friends, Americans, humans..); this probably is a minority, and marginal, vocation, and should be nurtured but not universally enjoined. But in the present culture I think that any serious attempt at living faithfully will put the practitioner on the margins of American society, and perhaps of acculturated Quaker society as well. I find it hard to see us a marginalized sect. For our numbers, our average success rate is staggering. We have had one of our members become an American President ( Hoover ), and we have built hugely successful institutions in our schools, and public schools in many places like New York. We sometimes feel marginalized when we must engage in bringing our successes back to the light, sometimes, but that is a mark of our success, in my light. As to Martin's critique of the response to our dear fFriend Tom Fox. I think the response was exactly what Quakers have always done. Some of us wrote immediately, worked night and day to make sure those holding him heard from the real power of Quakerism, the loving light of the children of light who are commonly called Quakers. That the institution lagged behind, is the way of the world. The difference is, we rise, hark to that still small voice within, and lovingly speak from that still small voice within. Some Friends wish to see us as having institutions which reflect our own light. Sure, that is human ego, and not always a bad thing. Friends, that should be a call to follow thy light, and be the activist Quakers who walked out of England and Ireland into the forests of this new land to attempt the peaceable kingdom. I've continued this discussion in the more recent "Are Quakers marginal, part two" post.